Obverse: GEORGE WASHINGTON, FIRST PRESIDENT OF THE U D STATES [below bust] G. .H. LOVETT N.Y. 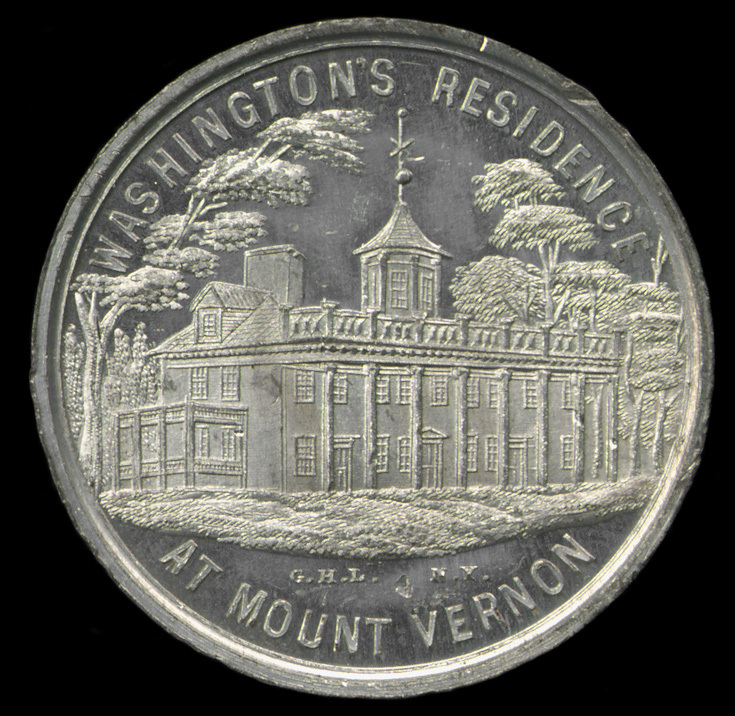 Reverse: [above] WASHINGTON'S RESIDENCE [below] AT MOUNT VERNON [below image] G.H.L. N.Y. Comments: This is the first in a series of presidential medals with their residence on the reverse (through Lincoln), issued by George H. Lovett of New York City between 1861-1865. The obverse contains a bust right portrait of Washington draped in a Roman mantle while the reverse contains a view of Washington's mansion at Mount Vernon. Comments: The obverse displays an undraped bust right portrait of Washington while the reverse displays the undraped bust left portrait of Edward Everett. 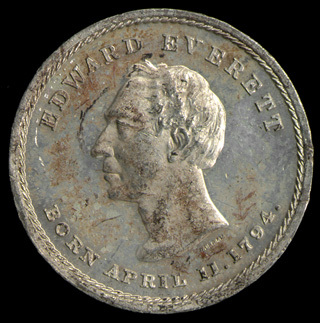 Everett was a prominent Massachusetts politician and orator. He had served as Governor of Massachusetts 1835-1839, U.S. minister to England 1841-1845, President of Harvard 1846-1852, was briefly (for four months) Secretary of State under Fillmore and then became a U.S. senator but due to his conciliatory position on slavery Bostonian abolitionist forced him to resign his office. In 1860 Everett ran as the vice presidential candidate for the Constitutional party. Reference: Rulau and Fuld, p. 68; Rulau, U.S. Tokens, third edition, pp. 211 and 528; Baker, pp. 57-58. The family vault at Mount Vernon requiring repairs, and being improperly situated besides, I desire that a new one of Brick, and upon a larger Scale, may be built at the foot of what is commonly called the Vineyard Inclosure,-- on the ground which is marked out -- In which my remains, with those of my deceased relatives (now in the old Vault) and such others of my family as may choose to be entombed there, be deposited." However nothing was done for almost thirty years, then in response to continuing humidity problems and an attempted vandalism Lawrence Lewis and Washington Custis contracted in 1830 for a new vault to be erected; the new brick vault for George and Martha was completed in 1831 and still stands on Mount Vernon. 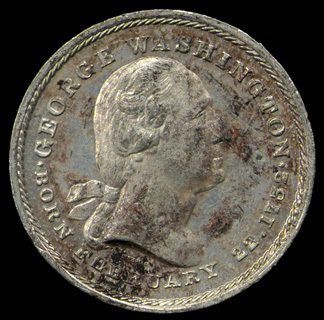 For further details see Eugene Prussing, The Estate of George Washington Deceased, Boston: Little, Brown, 1927, pp. 240-242. 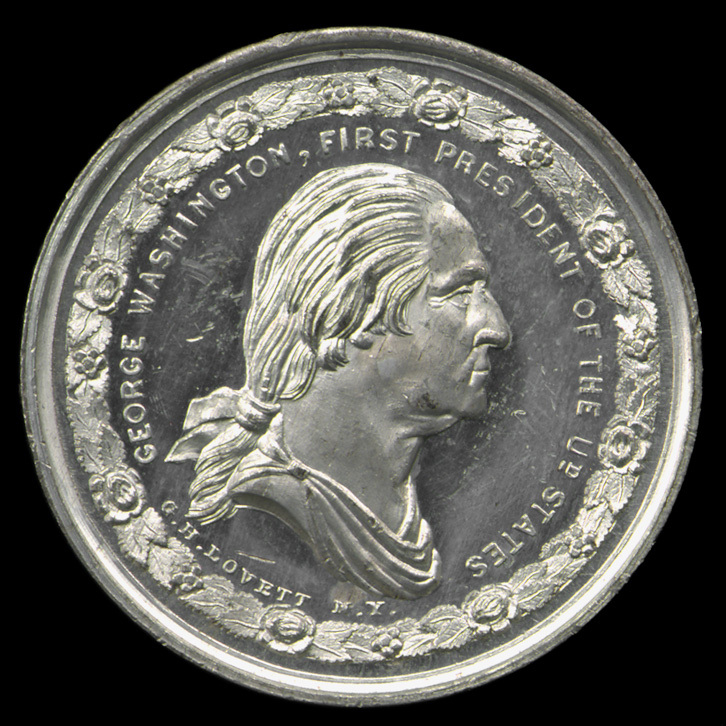 The obverse of the Washington's tomb (or Resurgimus) medal displays an undraped bust right portrait of Washington, with his name above and his birth date below. 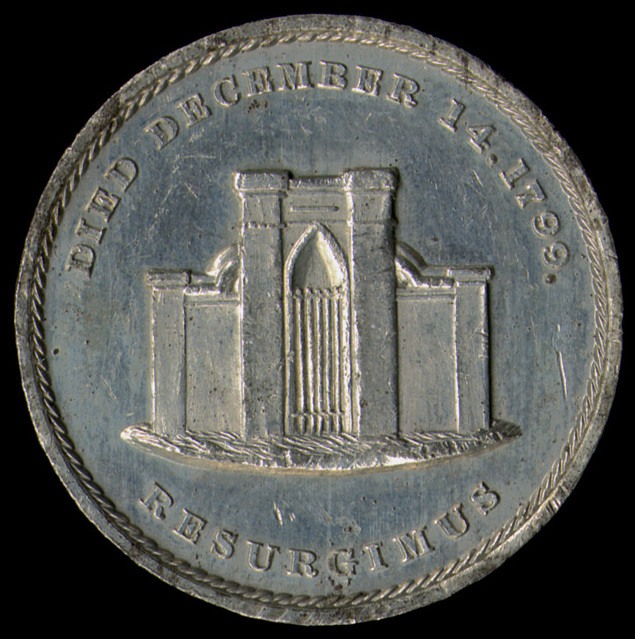 The reverse shows the facade of Washington's tomb with his death date above and the Latin RESURGIMUS (We rise again) below. The medal was designed and struck by Joseph H. Merriam in the early 1860's as is explained in the entry for Baker 114, listed above. 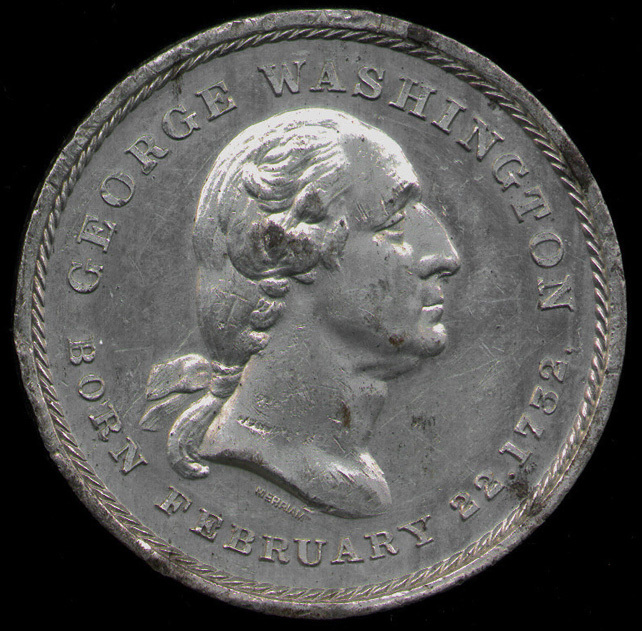 The medal was originally issued in silver, copper, bronze and white metal (Baker 122), there was also a copy of this medal struck in the 1860's in white metal, designated as Baker 123. Rulau and Fuld distinguish it from the original striking with the statement "not nearly as well executed." The example shown here is probably the contemporary restrike. The obverse differs from the above (Baker 114) example and from the photographs of the orginal strike listed in Rulau and Fuld in that the lettering on this example is smaller with more space between the upper and lower legend. Also, this example lacks a stop between the G in GEORGE and the B in BORN, which is found in the original strikes. References: Rulau and Fuld, pp. 100 and 260; Rulau, U.S. Tokens, third edition, pp. 211 and 528; Baker, p. 65.